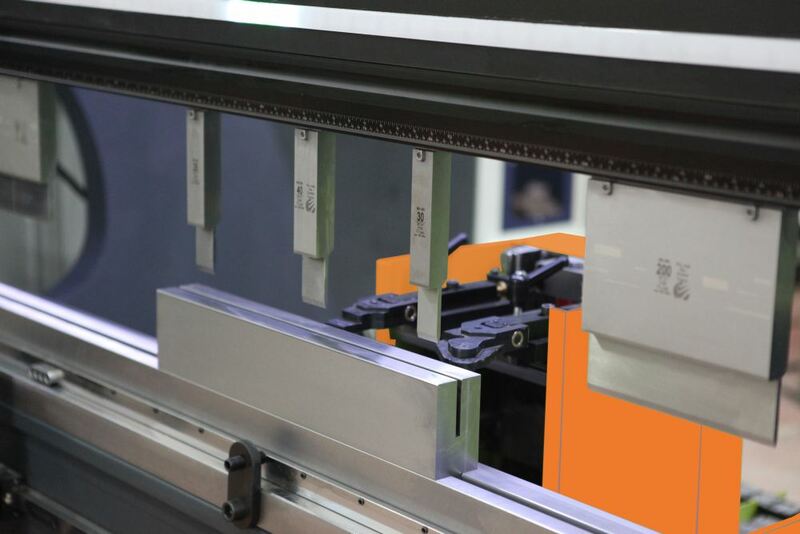 A good press brake is only complete with a good control. A good control should be your companion and should solve problems for you, not the other way around.It should be simple enough both when you want to bend a one-hit L beam or want to tackle a complex 3D drawing. Creating a simple yet elegant companion for you was our primary goal. We hope you like the features below we designed for your production to be more efficient and your products to be flawless. Whether you’re bending a box panel or a simple two hit part, you will find NexT’s carefully and elegantly designed 2D and 3D part creating interface a joy to work on. On its 17″ beautiful and colorful touchscreen, a large canvas will display your part and will let you easily manipulate with taps and touches. 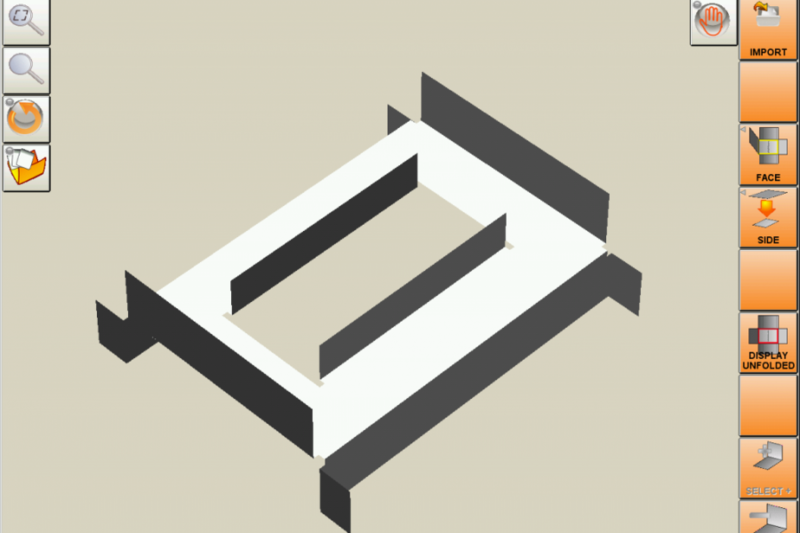 You know you can easily create your part in 2D or 3D on NexT but you don’t even need to do that if you already have a DXF drawing of your part. Just load your DXF directly to the control or on the offline software and watch NexT magically transform a flat drawing in to a 3D part. If you are creating your DXF on SolidWorks, NexT will read all the embedded information in the DXF like angle, allowance, radius, thickness and material type and will create a full 3D part without you touching a thing. One part, three different tool stations. 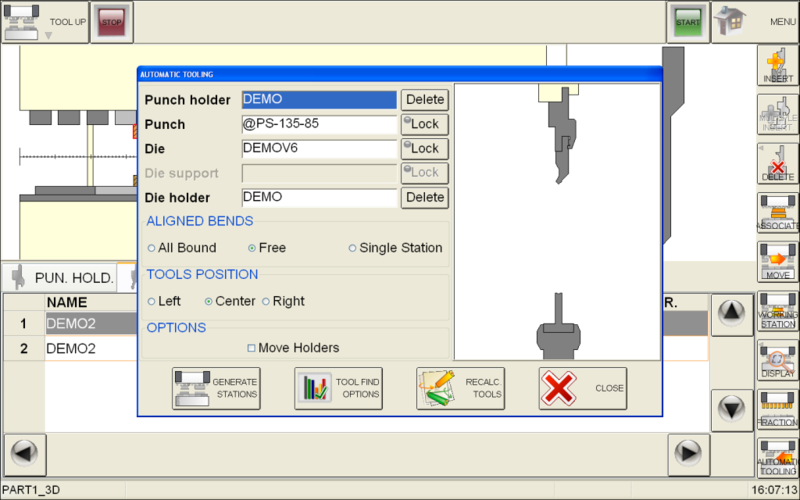 On NexT, it takes only a minute to set three or more different tooling stations. 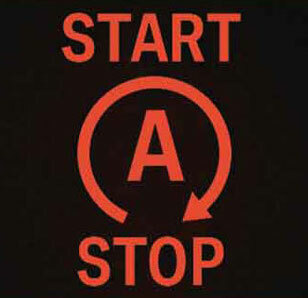 Of course we don’t want you to stop your production while you are preparing a new part program. 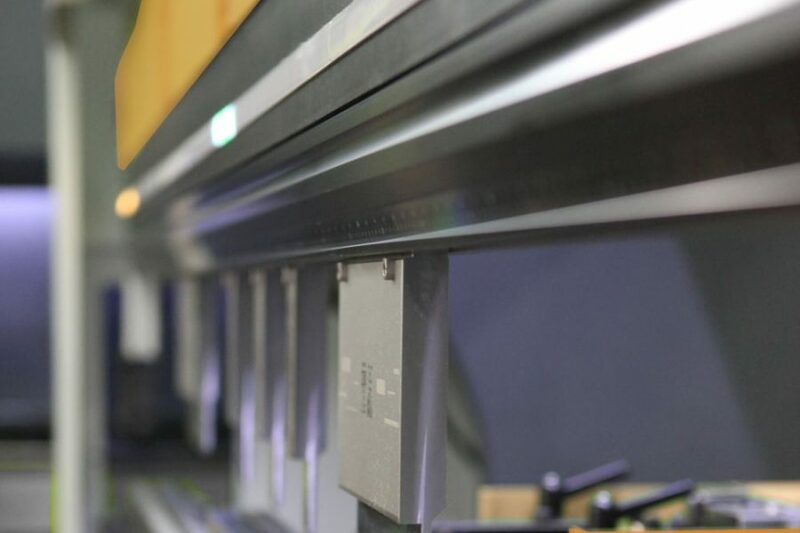 You can prepare your part programs or import your DXFs on your PC and transfer them either through a network connection or with a USB thumb drive without stopping your press brake what it does best, running parts! Creating your part is half the job done but if you don’t choose the right tooling for your part, you will not get a finished part but a scrap. Even worse, you may end up damaging your tools. 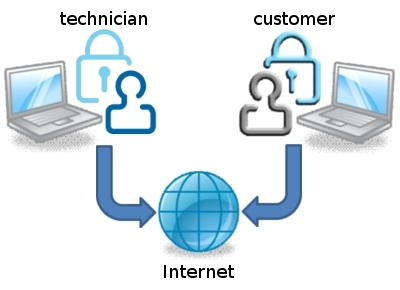 This scenario is more common than you think and that is the reason we designed auto tooling feature on NexT. 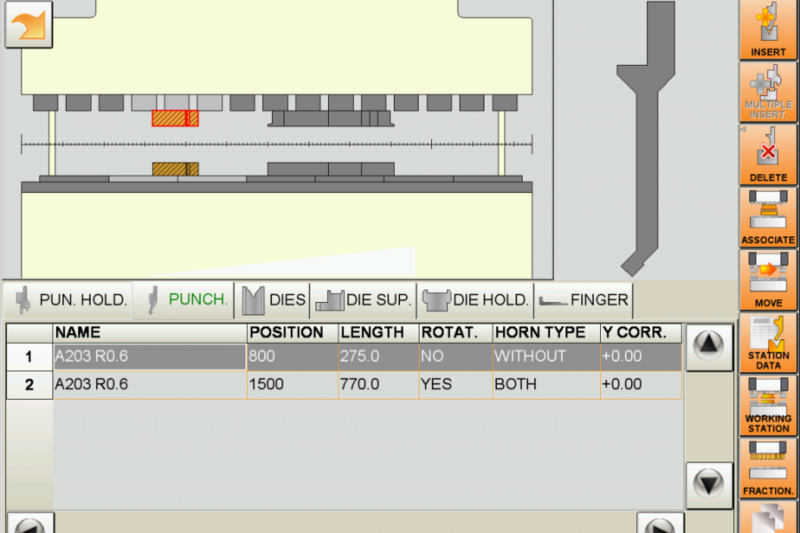 Once you finish drawing or importing your part, all you need to do is to hit autotooling button and NexT will offer the right punch and die. Stress free! When you are running a press brake, you spend most of your time on the control, creating parts, modifying parts and running parts. This is why we spent a great deal of time creating our user interface, making it simple yet elegant, powerful yet easy to grasp. If you are focused on productivity and efficiency in your shop floor as we are, you are aware that setup times for your machine can make the difference between running a profit or loss. Different jobs require different tools and frequently changing tools on a press brake with a clunky clamp system is no fun. We agree and for this reason, we have equipped PrimaForm with the easiest tool changing system you can find. Just mount your punch into the holder vertically and press the clamping button. 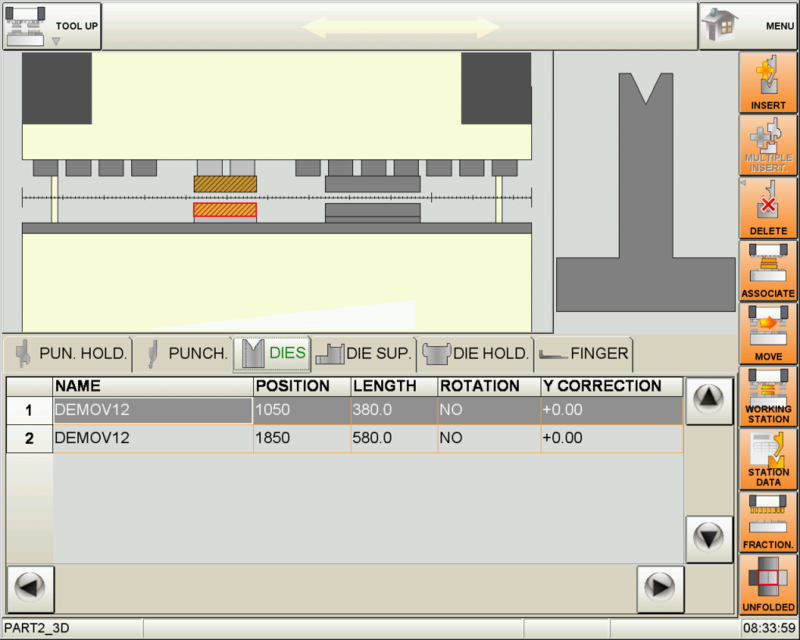 The system will auto-seat and auto-align. You are done! PrimaForm’s high precision punch and die clamps use industry leading, CNC deep hardened Wila punches and dies. 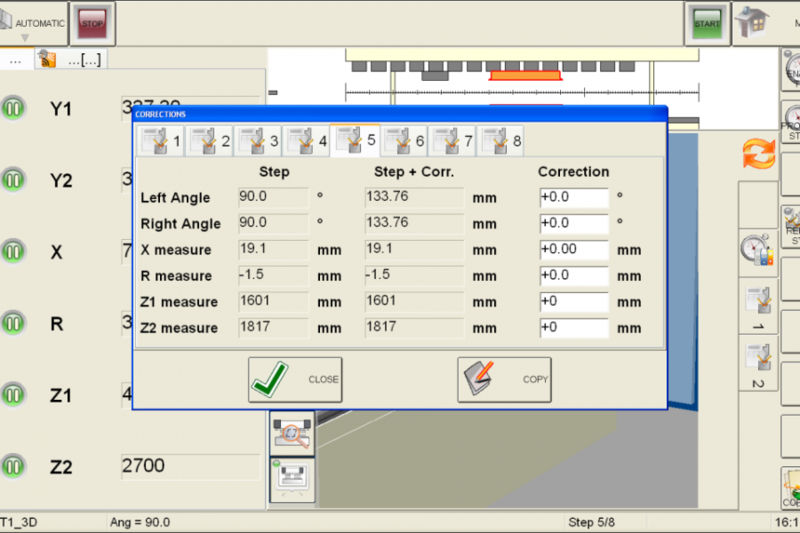 This ensures top accuracy whatever the material is and whatever the job is. A common scenario. You need to set up multiple tool stations for stage bending a complex part. 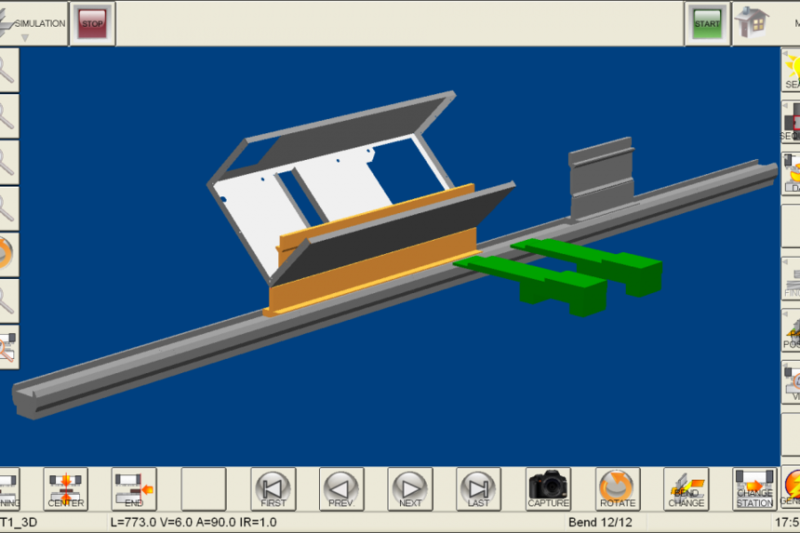 Backgauge fingers are already programmed by your CNC control but how do you align your tools with the fingers for each bending step? Enter VisioForm! Our unique tool locator is a strip of LED lights that sit right above the punch clamp and will help you set up your tools easily by lighting up the exact spot you need to mount your tools. 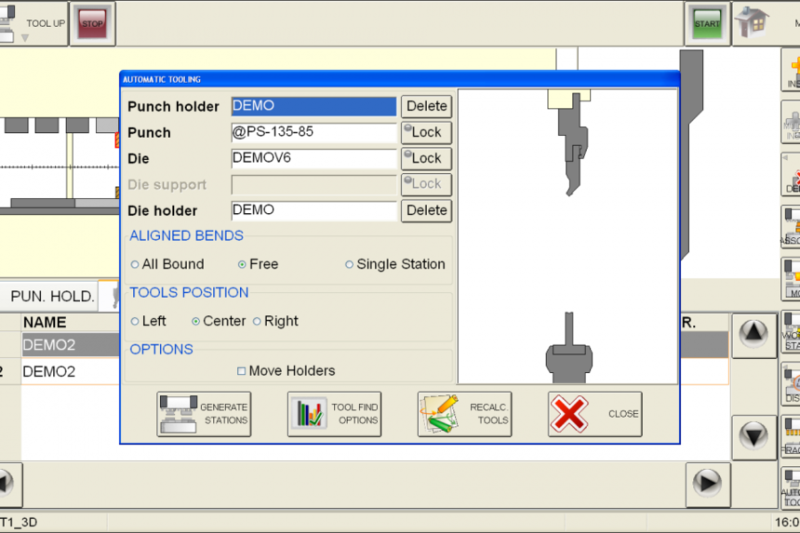 Along with the vertical punch mount ability, VisioForm makes it a breeze to set up your tooling stations. 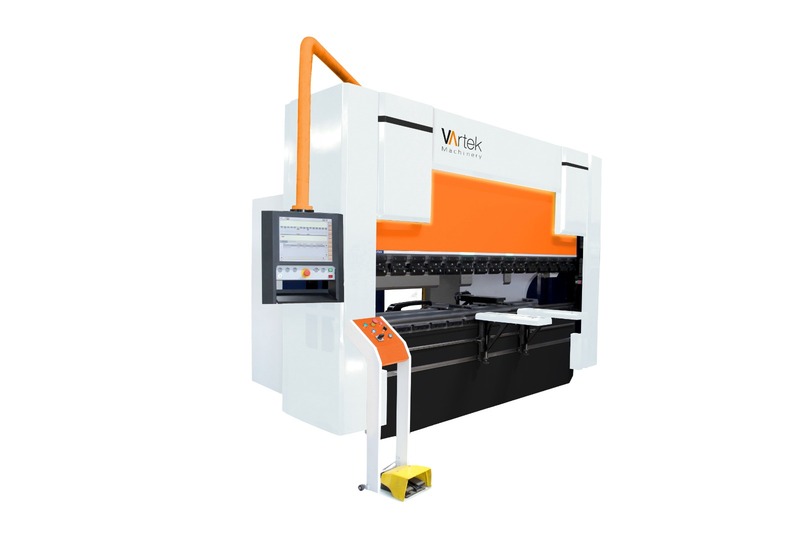 But VisioForm does not stop there and also continues to guide you during the bending process. 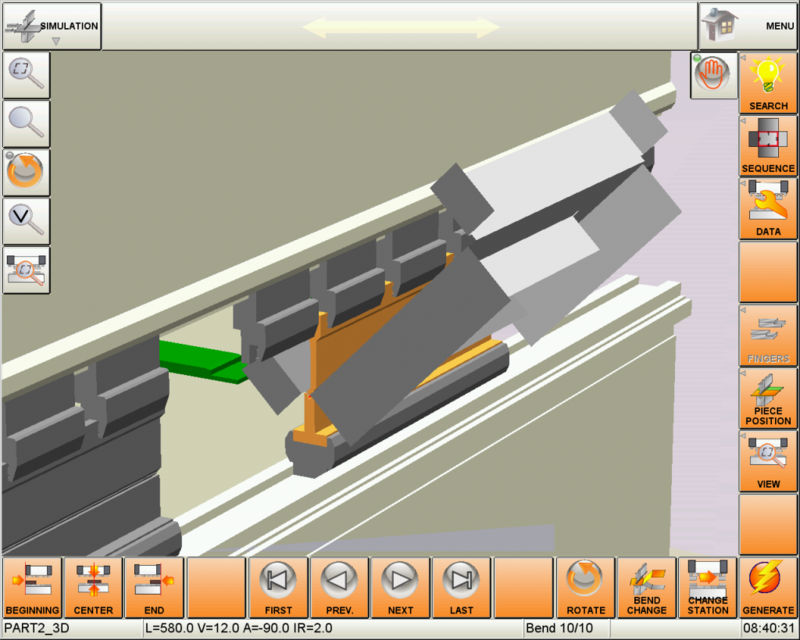 For each bend, VisioForm will light up the correct tool station so you will know where to gauge your part without even looking at your control’s screen! Turning blueprints into parts is another process that can be time consuming and a productivity killer. No more with PrimaForm. You get a free copy of offline software that will run on your computer. 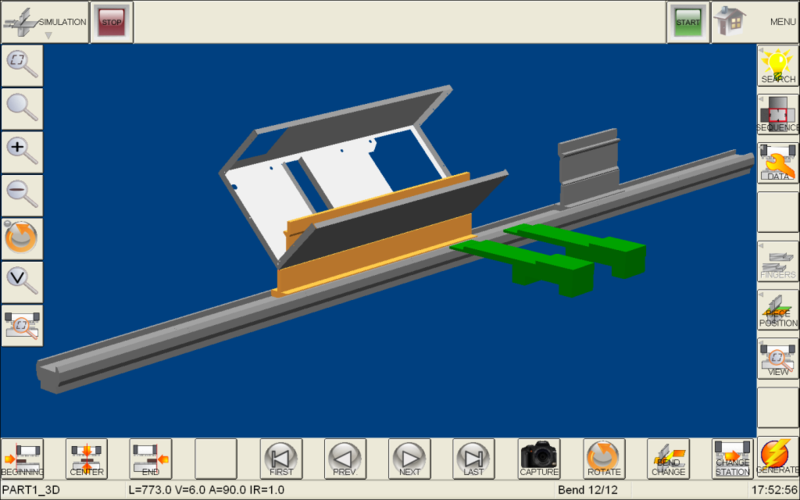 You can create part programs in 2D or 3D and send to PrimaForm via network connection or transfer them on a USB thumbdrive. 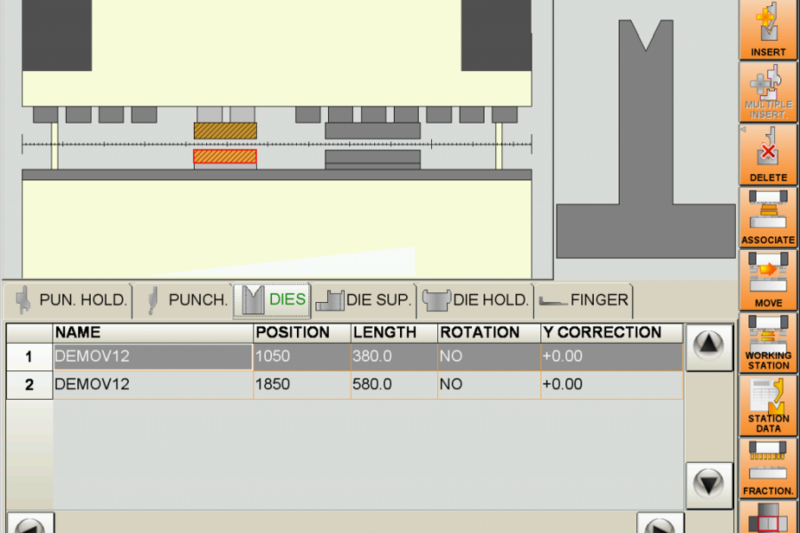 You don’t even have to program your part manually. 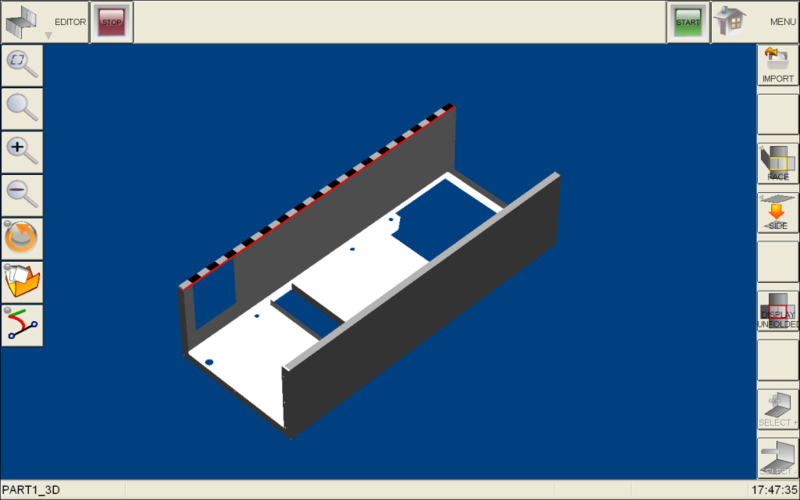 If you have a DXF drawing of the part, NexT can process that flat DXF and turn it into a full blown 3D part program! DFX drawings exported from SolidWorks* will have crucial information like thickness, type of material, angle, allowance and radii automatically embedded and NexT can read all that information and create a fully formed product to run immediately without any intervention from you. Choosing the right punch and die for the job is crucial. Choosing wrong tools not only causes your part to be scrapped but may even damage your tools. Let NexT choose the right punch and die with one touch of a button. 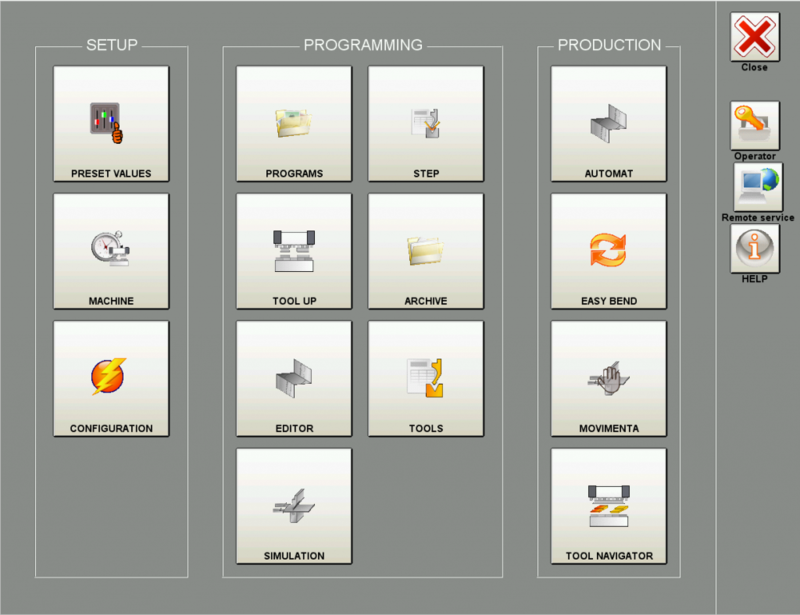 When you program a part, NexT’s autotool feature will search your tool library and will offer you the right punch and die for the job in hand. Bending parts with different size flanges is another difficult job that is time consuming and error-prone without the right backgauge. 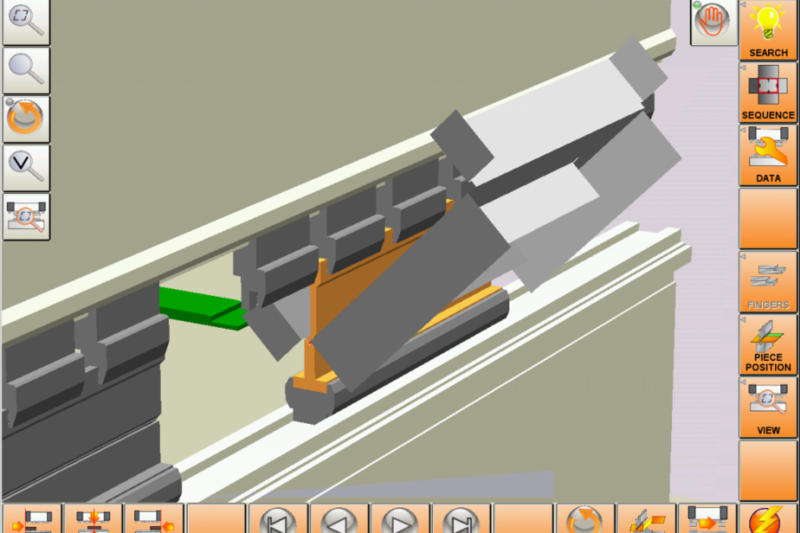 PrimaForm’s backgauge lets you precisely locate each finger independent from each other. This gives you great flexibility for complex parts that are difficult to handle. 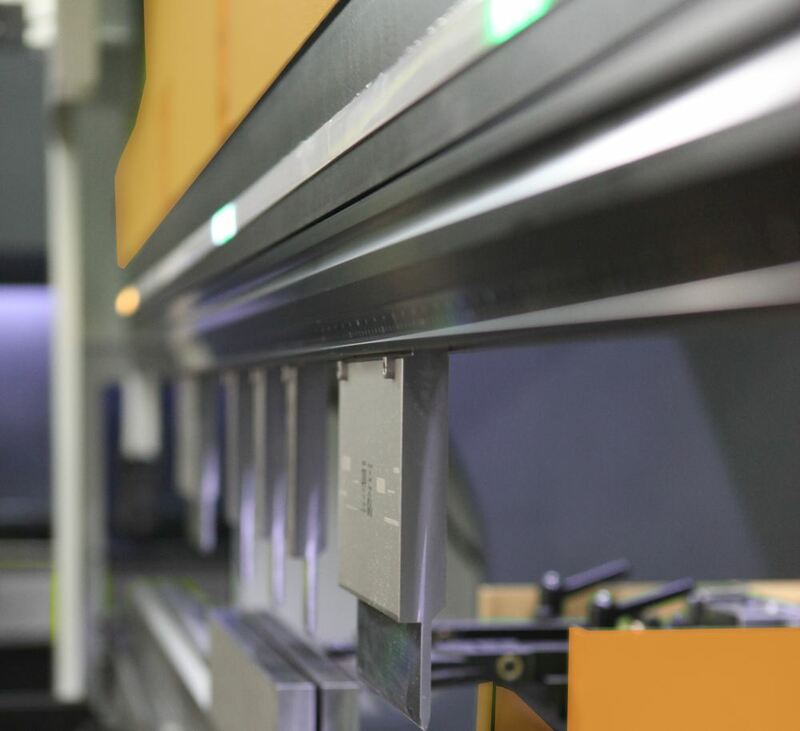 PrimaForm’s multi axis backgauge also allows you to easily bend tapered (conic) parts without the hassle of marking the bending lines. 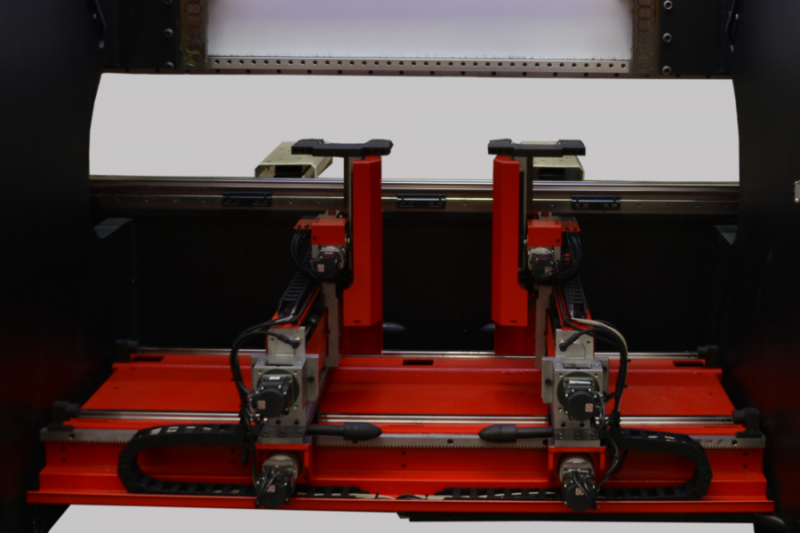 AccuraForm’s CNC controlled bed crowning system negates the deflection of lower bed during bending and ensures all-even angles along the full length of the bed. 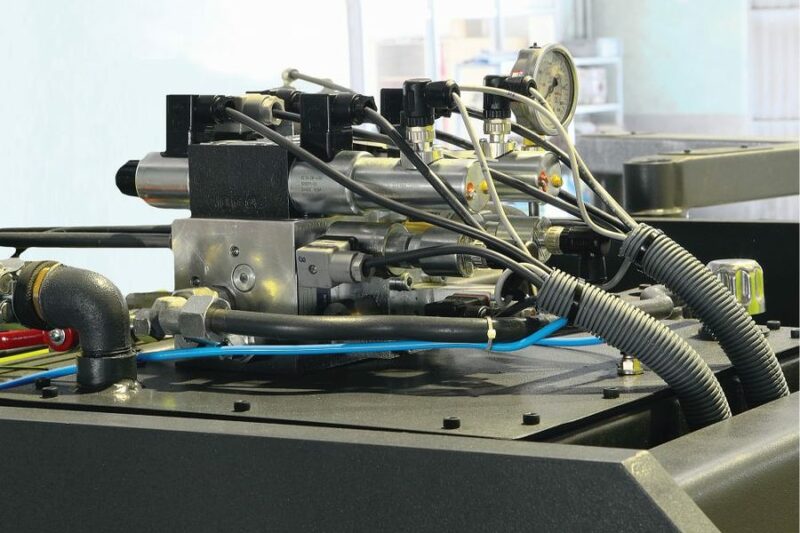 State of the art Hoerbieger hydraulics with servo proportional valves, honed and chrome covered cylinders with precision ground pistons and high quality seals ensure decades of trouble-free operation. NexT 3.0 17″ 2D/3D graphic touchscreen control. Honed, chrome covered cylinders with high precision ground pistons. 6 axis backgauge (X1,X2,R1,R2,Z1,Z2) running on ballscrews with servo motors and independent finger blocks to easily gauge complex parts and tapered pieces. VisioForm LED bend guide system. Hydraulic punch holder with vertical mount, auto seat and auto align function. 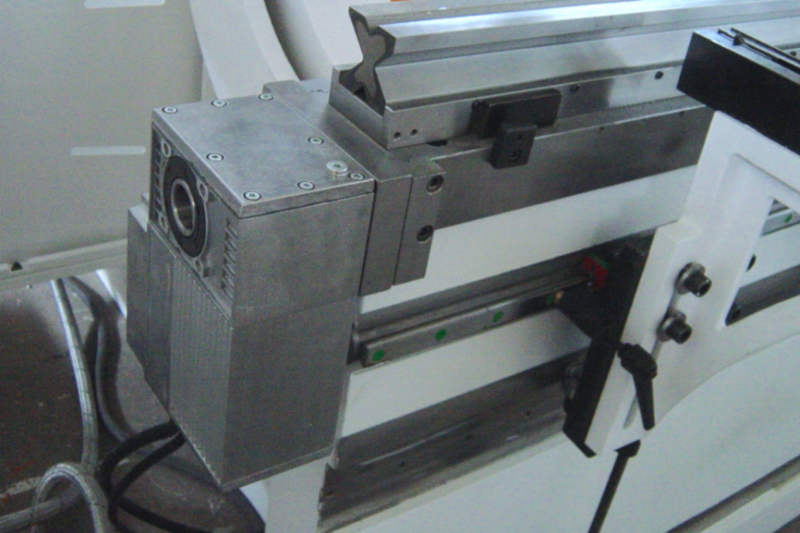 Hydraulic die holder with one touch lock mechanism. Oil coolant to maintain optimum oil temperature and consistent bends in long runs. 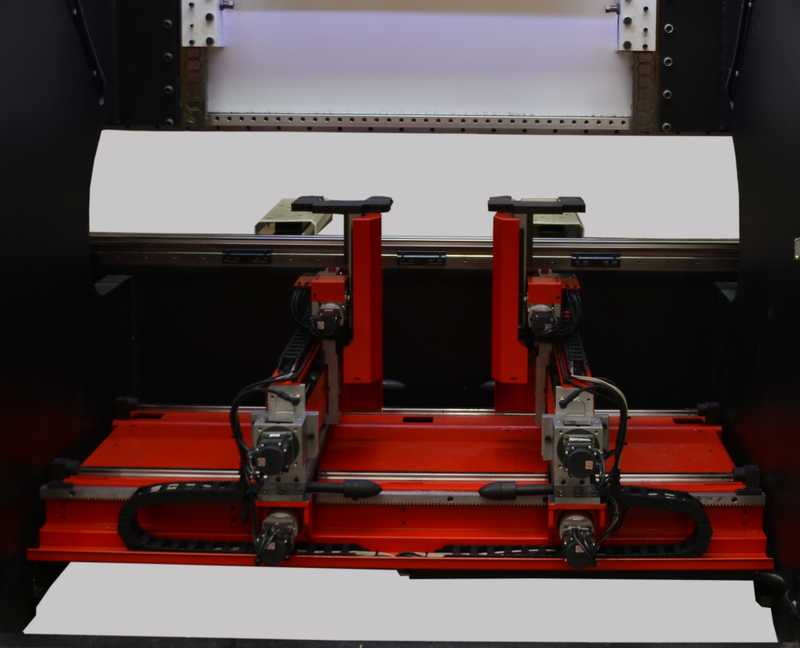 CNC controlled bending aids in front to easily handle large plates. 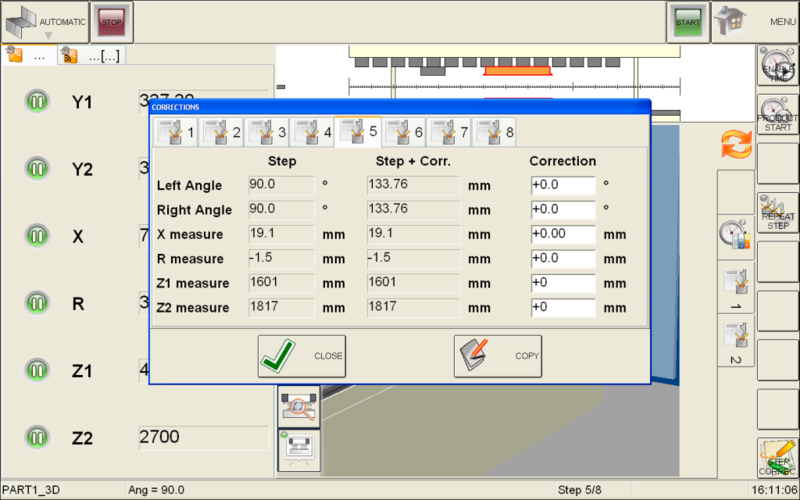 Real time angle measurement and correction system. PrimaForm equipped with the easiest tool changing system you can find. 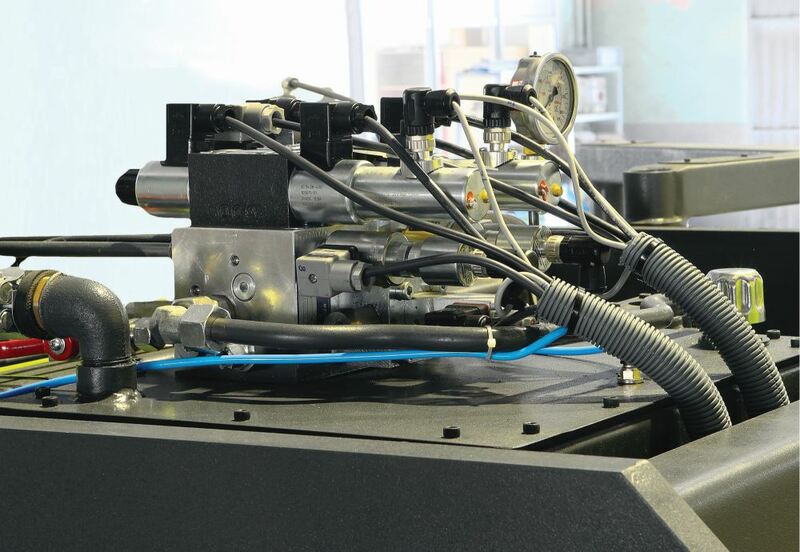 With hydraulic tool clamping system you just mount your punch into the holder vertically and press the clamping button. 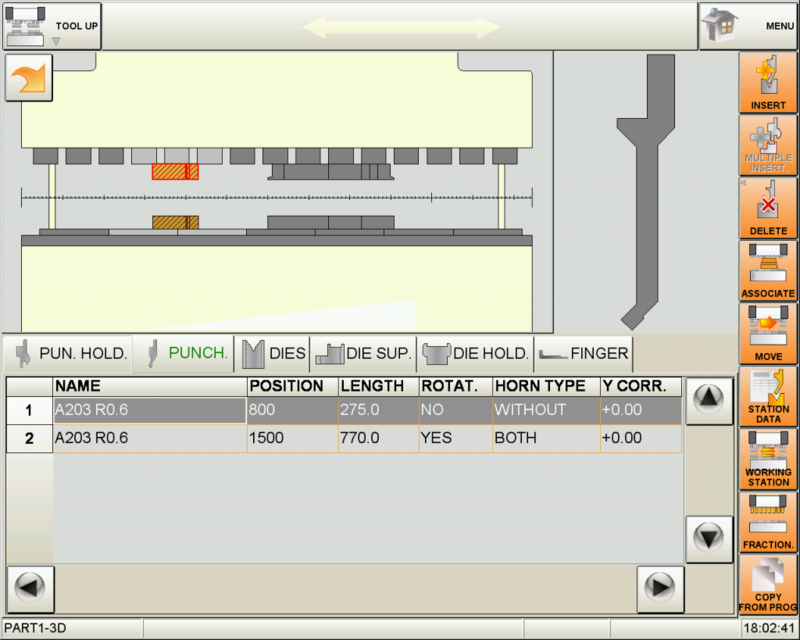 The system will auto-seat and auto-align. You are done! Our unique tool locator is a strip of LED lights that sit right above the punch clamp and will help you set up your tools easily by lighting up the exact spot you need to mount your tools. This multi axis backgauge allows you to easily bend tapered (conic) parts without the hassle of marking the bending lines. Turning blueprints into parts is another process that can be time consuming and a productivity killer. No more with PrimaForm. You get a free copy of offline software that will run on your computer. 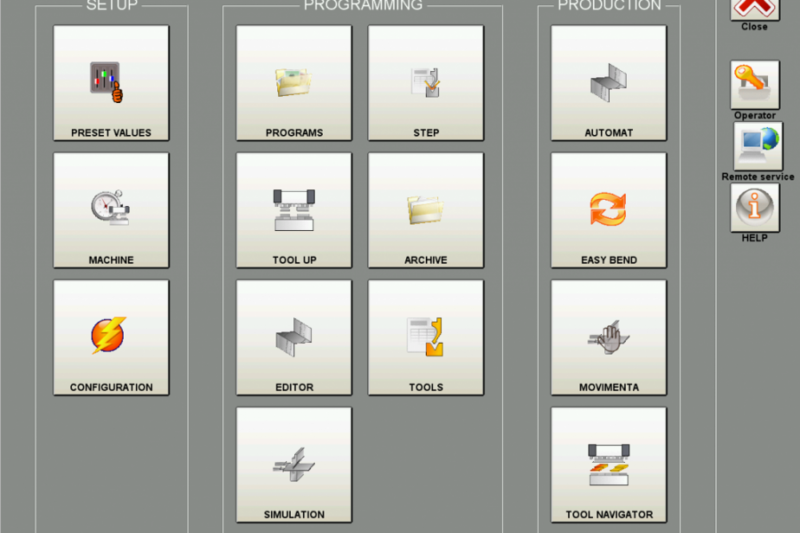 You can create part programs in 2D or 3D and send to PrimaForm via network connection or transfer them on a USB thumbdrive. 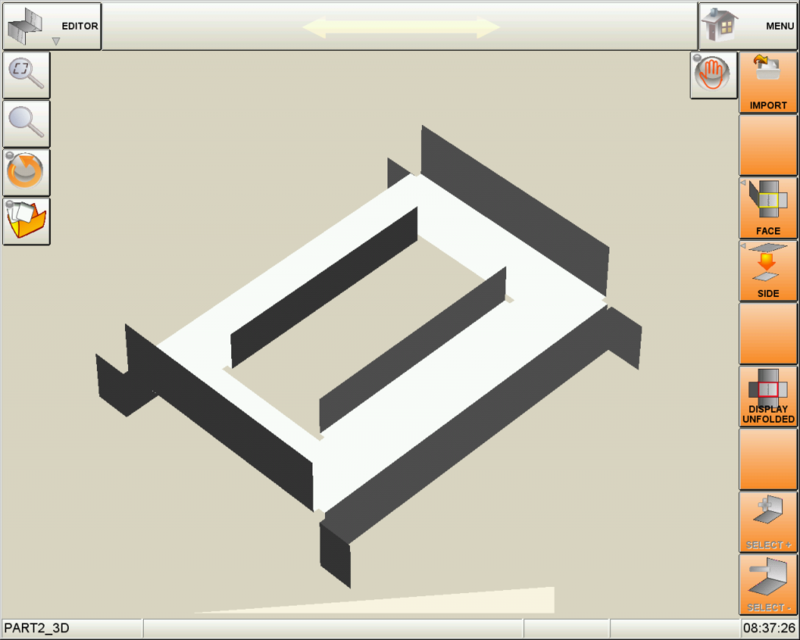 Just load your DXF directly to the control or on the offline software and watch NexT magically transform a flat drawing in to a 3D part.